I intended to do an overview of several apps, but a sketching app is too personal to be objective. After 3000 words of explaining and reviewing, I decided the post had grown too large. So instead, I'm breaking this into two parts. This part (part a) is a review of several apps. I'll cover what I see as pros and cons and finally narrow to a couple apps. Part b will be a walk through of what I am actually doing with some of these apps. Sorry about breaking it up. This is a long post, so if you're looking for a single recommendation, I'll disappoint you early. I'm hesitant to say that I've found the best solution. In my opinion, this is still an unaddressed need on the iPad. 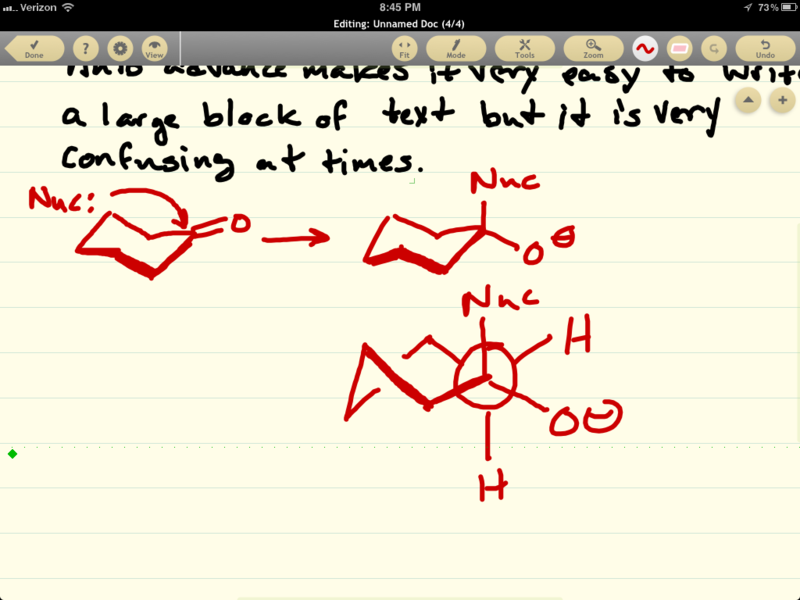 If you just want to doodle in an app then Note Taker HD will accomplish almost anything you need. However, the objects are not transportable to other apps. 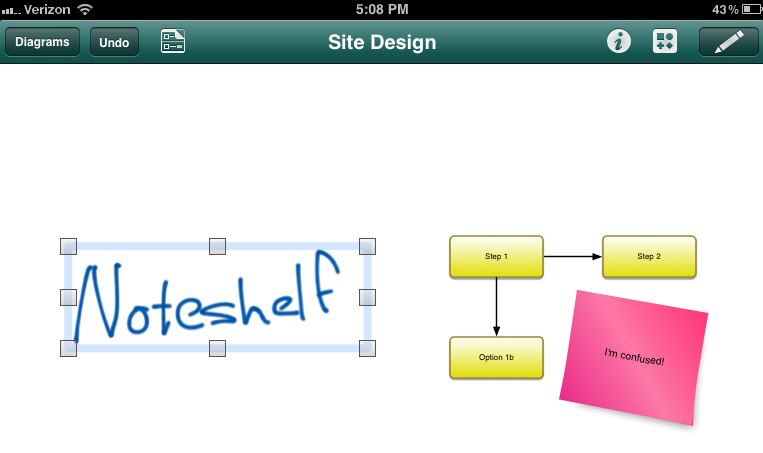 I use a combination of OmniGraffle and Noteshelf. Noteshelf gives me good options for drawing with a reasonably good ink system. OmniGraffle gives me everything else. This is not a general review. This is a review for someone exactly like me. Like pen and paper, I have very specific criteria for a sketching app. Anyone that appreciates a good pen is very picky about the properties of the instrument. I will attempt to describe my criteria in each section. The following sections will attempt to describe what I think an ideal sketching application should have and how I use my iPad to help synthesize ideas and data into a meaningful conclusion. For me, a sketch is anything that is not typed text. But it may contain typed text. I consider a sketch any combination of drawings, geometric objects, graphic images and text. I will discuss the following apps.2 They are the best of breed for my particular needs. Apps are listed from most to least used. The links are to the AppStore. The vast majority of my sketches start as free hand drawing. I'm a competent doodler and I can draw with either my finger tip or a stylus. I prefer to use the Cosmonaut stylus for lengthy sketches. A good sketching app must provide a good ink system. What makes good ink? A combination of performance and aesthetics. The ink should be drawn to the display as fast as the drawing implement moves. Any lag in the ink is highly distracting and inefficient. From my experience this is achievable but difficult. Most apps get it wrong but there are some apps that feel like actually writing on paper. As fast as I can move my finger, the ink is laid down. The aesthetics of the ink is more complicated. My personal preference is that there should be line smoothing applied as I draw. Most apps do not draw a continuos curved line. Instead, a curve is constructed from many smaller straight lines. Some apps make that obvious and their ink is ugly. A good app will smooth the line and make it look fluid. 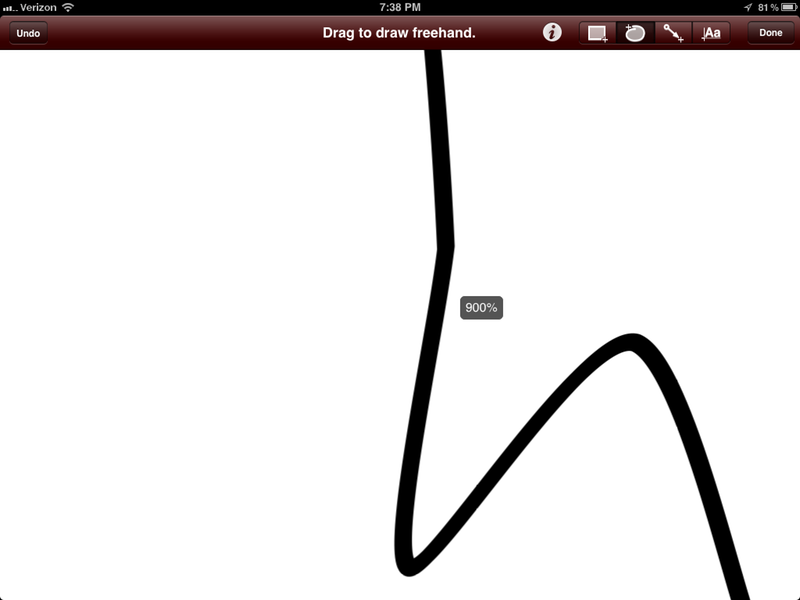 Several apps also adjust line thickness based on acceleration of the drawing implement. The faster the drawing, the thinner the line. I like this style. It's what I expect from a pen. It makes the iPad experience feel like what I expect. Penultimate has one of the best ink systems I've tried. It's fluid and fast. You know that fascinating desire to just flick the iOS windows back and forth because they move so smoothly? That's how Penultimate feels. It's so fun that sometimes I open it just to doodle. That's what a sketch pad should do. There are several other apps that get the feel right too. Each one is slightly different but they are all very good. 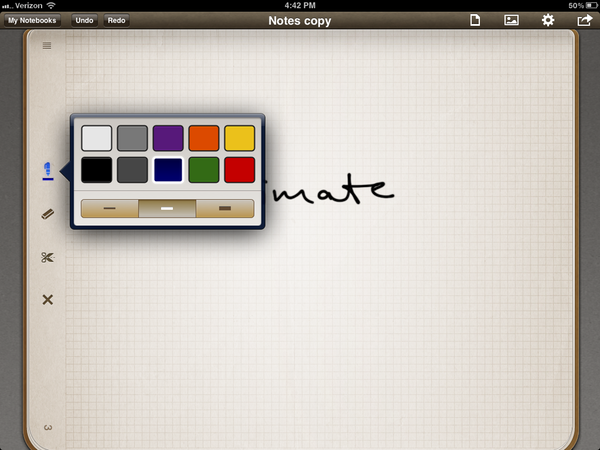 Adobe Ideas, Noteshelf and PhatPad all have excellent ink systems. 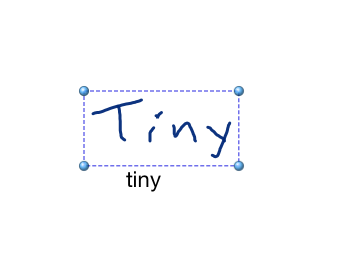 TouchDraw's ink over corrects when drawing. 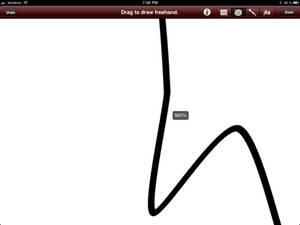 To be fair, TouchDraw is intended to be a vector drawing app. For this reason, I do not use it for sketching. Well, really, I don't use it at all. I think OmniGraffle is better in this genre of apps. 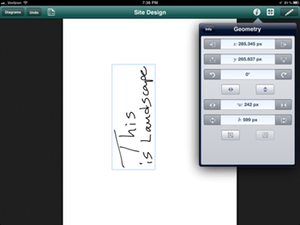 OmniGraffle has a reasonable ink system, but again, it is mostly intended as a vector application. The smoothing applied to the ink ruins most hand writing. However, it is very good for a basic sketching. PhatPad has an acceptable ink system. However, a feature that is unique to PhatPad is the ability to select a hand-written note and convert it to text. If I just want to enjoy sketching something that is an isolated drawing, Penultimate is what I prefer. 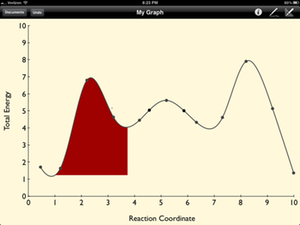 But for reasons that will become obvious, it is not the application I prefer for serious work with my iPad. 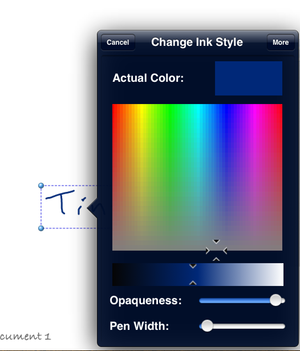 Most apps provide solid tools for reformatting a sketch by providing additional line widths and colors. Some are better than others. I don't care for Penultimate's minimalist formatting options. I like a lot of PhatPad's features, such as its easy access for adjusting a lines formatting by just selecting it. The formatting options are extensive. I find the Noteshelf UI a bit tedious. I don't go in for the simulated pens. But nothing beats OmniGraffle for formatting options. I have big fingers. Most iPad styli are also very thick. That means it's tough to draw small details on my iPad. To get around this limitation some apps include either a zoom mode or better yet, pinch to zoom multi-touch gestures. 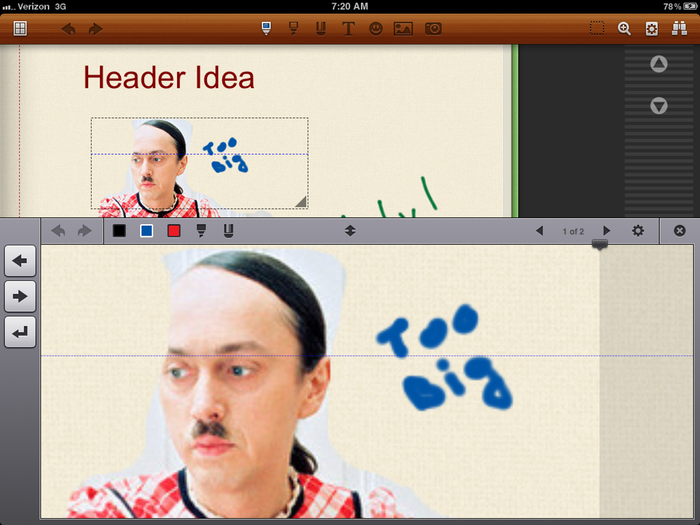 Adobe Ideas gets this right. The app uses pinch to zoom, which is much more natural to me than a magnifying glass concept. The Adobe Ideas zoom is fast. But more than that, it has a ridiculous zoom level. Here's an example. It treats every line like it is a vector graphic. Note Taker HD has a useable zoom, but there is too much focus on using the magnifying frame. I find that too limiting, too distracting and too inefficient to be used regularly. I personally do not like Noteshelf's magnifying box. It's too limiting as well. Additionally, I do not think the ink performs well even at a minimal zoom level. OmniGraffle also gets this right. I can easily zoom with pinching in the middle of a sketch. There's no need to bring up another editing frame or enter another mode. You read that right. That's a 900% zoom. I define figures as anything that is not a photo or line drawing. The most common figures I use are arrows and boxes. Many apps provide a library of additional figures, some to an awkward extent. If an app has more than 10 figures, it becomes unwieldy and delays the process of quickly grabbing the one I use most often. To be useful, figures should be more than just a black and white image. OmniGraffle wins for this category. The app provides a few basic figures that can be resized and restyled. The app also offers magnetic connectors which allow other objects, like arrows, to snap into place along their edges. 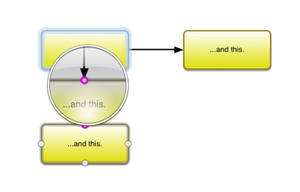 Creating flow diagrams in OmniGraffle is very easy. But OmniGraffle also wins for variety of figures, thanks to GraffleTopia. The OmniGroup provides a free repository of community contributed artwork for use with OmniGraffle. All of these stencils are usable in the iPad version as well. I could not possibly go through everything, but suffice it to say that there is something for everyone. There are iOS interface stencils, gardening stencils and even stencils that look like post-it notes. Each stencil can be dropped in and resized and arranged. The stencil collection is entirely customizable, which means I know what I have and can remove anything that I do not find useful. Note Taker HD also provides a good variety of objects ranging from chart axes to flow diagram objects. This is the cut-off for most apps. They fail to understand that a sketch can exist outside of their application. I take a lot of notes in OmniOutliner. 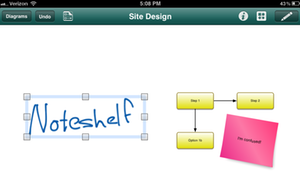 The best use of a sketching app for me is to drop in, quickly get an idea down, and copy it back to my outline. I don't want the entire page. I don't want to keep things in a binder or a faux journal. I don't want an email. I want a single selection. 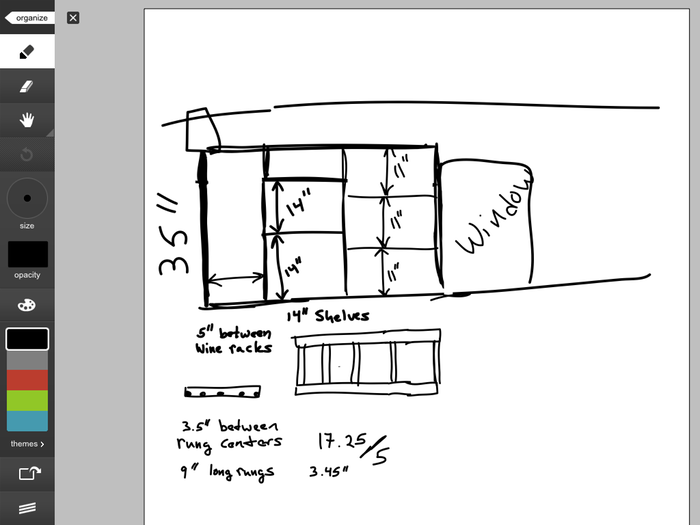 I want completely transportable objects. This is equally true of pasting in apps. Many apps only expect an image to be added via the photo album. That's the dumbest way I know of to add an image. I usually want something from a Web site or another app, not a family photo. My typical workflow starts with a doodle. I'll go to the web to grab an image and then add it back to my sketch. I'll then add notes and call outs until I think I have the complete thought. The problem with Penultimate though, is that while an object looks good in landscape, it's actually rotated by 90 deg. when copied. Here's the object pasted into OmniGraffle. 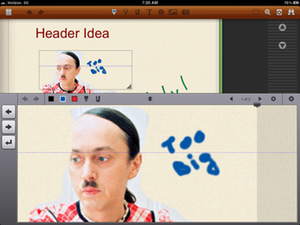 Luckily OmniGraffle has excellent tools for manipulating objects. For example rotating by 90 deg. This only applies to the small number of apps that actually allow for object selection. The most common method of object selection is the rectangular selection area. This is the very minimum I require from a good sketching app but still not the preferred tool. I prefer a free-hand selection. A tool that allows me define a path around an object to create a selection. Working on a computer means that I don't want to just mimic pen and paper. I want to gain some additional options. Object selection and manipulation is one of those options. Often, I will draw two objects on different pages or regions of the page but ultimately they apply to the same concept. Rather than redraw either one, I want to select the object and copy or move it. Sometimes I want to rotate it or resize it. Other times I want to change its style. This really goes with the preceding section but I'm amazed how many apps don't provide this feature. Resizing and restyling an inserted image might be unnecessary for most sketches, but it's a nice feature to have occasionally. There's only a couple of good options for the doing this on my iPad. Annotations are the bits of text that are not hand written. Some apps provide a tool to drop a text box down anywhere. Some have an additional option to add a text caption to any object. I like having both options. There are only two apps that I think do a good Job. Again, OmniGraffle is excellent at this. 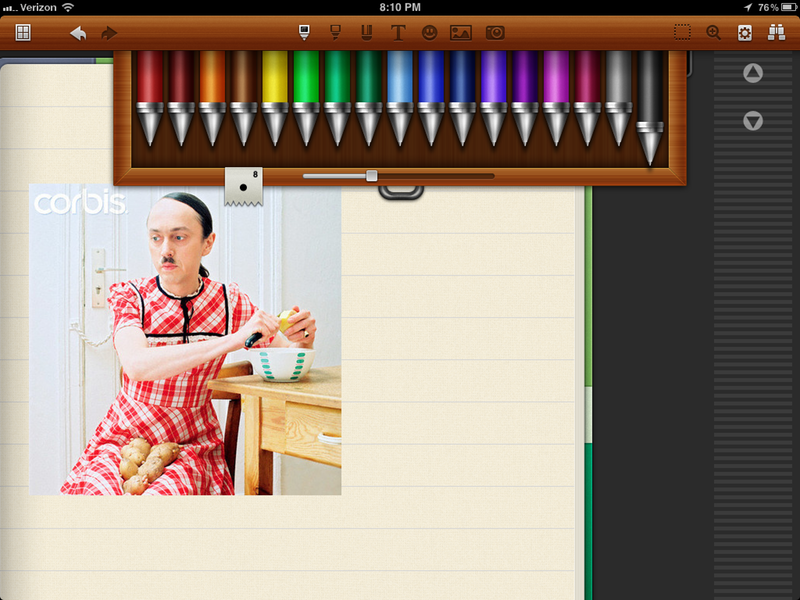 Note Taker HD has some good options but I don't think they look as attractive. There are some very specific use cases that most apps do not fit. 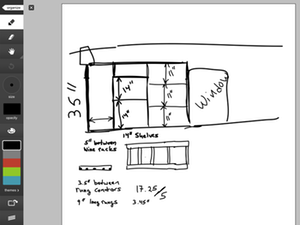 One that is very common for me is extracting information from a web page and incorporating it into a sketch. I don't just mean copying an embedded image. I mean creating an arbitrary selection and extracting it. slingNote wins in this category, hands down. Sling Note is part browser and part sketching app. The unique feature is the way it allows for copying of information out of a web page. The selection tool allows for free-hand selections. I can then drag and drop an image of the selection into the sketch area. I can also use this to get the selection out of the app and into another one. Sling Note integrates with the iOS pasteboard. That means I can quickly grab an element from a page and add it to an OmniOutliner note. That beats pen and paper any day of the week. Then there is OmniGraphSketcher. This is a one of a kind app. It's singular purpose is to create attractive charts without the pesky need for real data. I don't use it a lot, but it's one of those apps that does its job perfectly. If I need to describe the energy coordinate for a cyclohexane inversion, OmniGraphSketcher is great. PhatPad is a competent sketch app but lacks some key features for my needs. It lacks the ability to get a drawing out of the app and it lacks an easy zoom feature. But it has something no other sketching app has: Handwriting recognition. PhatPad is the little sister to the robust tool WritePad. But I actually prefer one feature of PhatPad. I can select Handwriting that I have already composed and then convert it to typed text. My biggest complaint with WritePad is that it converts on the fly. If it gets transcription wrong, I have to either correct it as I write or get nonsense out at the end of the note session. PhatPad allows me to take all of the notes I want and only transcribe selections later. I never lose the context around the text. I rarely need vector art. I can get most of what I want with more simple tools. I don't have the time or patience to learn a proper tool. 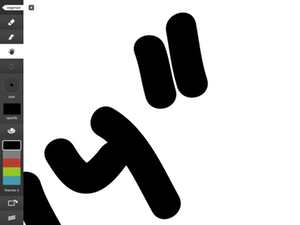 However, the occasional vector art is nice. I keep TouchDraw on my iPad just for that occasion. What Do I Actually Use? I mostly use Noteshelf and OmniGraffle. 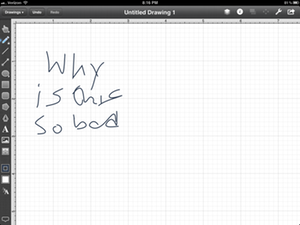 Handwritten stuff and crude sketches go into Noteshelf. When I want to do anything else, it goes into OmniGraffle. I can send objects between the apps by way of the iOS pasteboad. I don't usually store my sketches for long term in these apps. Generally, some small amount will make its way into OmniOutliner or another app. It's because of this that most apps do not suit my needs. The ability to select a single object and copy it to the pasteboard is crucial. Almost all other features are insignificant in comparison. My sketches generally end up as part doodles or hand written notes from Noteshelf and part OmniGraffle. Congratulations. You made it this far. As a bit of a payment for your dedication, I'll reward you with a double recommendation. 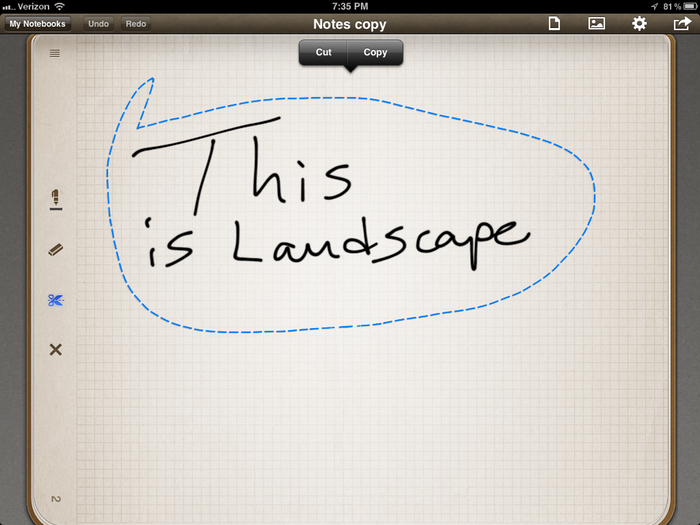 If you only want one app and you keep everything in that app, get Note Taker HD. It could get me most of the way towards where I need to go. 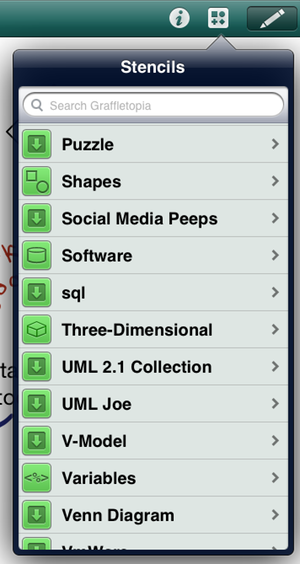 If you need to get objects onto the pasteboard, then get OmniGraffle. 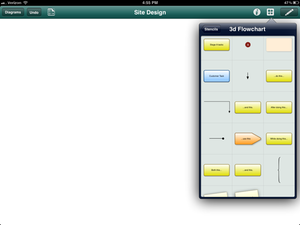 It is the super star of design and workflow sketching. 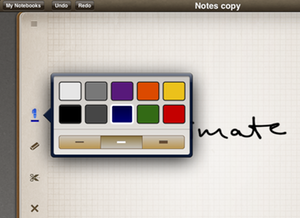 Note Taker HD provides some excellent ink for doodling as well as some extremely well thought out tools. Don't be deterred by the Note Taker HD UI. It's ugly. But that ugly belies a powerful and well considered set of features. 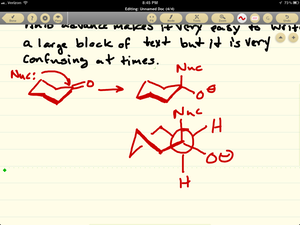 Note Taker HD has s steep learning curve because the UI is so bad. Each feature has been lovingly implemented but given menus that are cumbersome and infuriating. It took me awhile to become comfortable enough with the app that I did not curse every time I used it.